You make many decisions when it comes to choosing products for your new home. But choosing Owens Corning HomeSide siding may be one of the easiest. That’s because vinyl is one of your best exterior options in terms of weather ability, durability and ease of maintenance. Our siding stands up to the most severe weather conditions, will not rot, peel or flake, and never needs painting to stay looking like new. Unsurpassed performance and flawless presentation. Whether you’re looking for maximum protection from the elements – or you simply want the best for your home. Reminiscence siding makes for an ideal choice. Enduring strength and style. This siding is for homeowners who want something out of the ordinary. Its thickness and unique design make it an outstanding choice in areas where the weather can get rough. Rugged good looks and a smart investment. 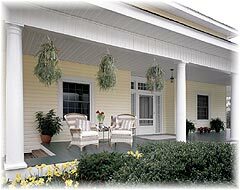 This siding brings the look of “just painted” cedar siding to your home with none of the worry or expense. Timeless design and solid value. Reserved. Refined. A standard to live by. Classic siding combines the look of a hand-cut wood finish with maintenance-free convenience. Old fashioned elegance and long life. This siding gives your home the elegant look of handcrafted wood. Once an architectural signature of the Old South – this look has been refreshed by Owens Corning, adding elegance to today’s home.